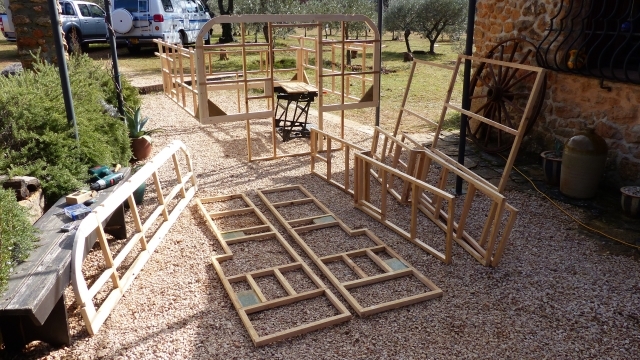 Three weeks into the project but finally over the weekend finished the last of the twelve panels that make up the framework of our newest camper. ... because once they're fitted together it (and I) will be stuck outside 'til it's finished (and goodness knows how long that might take) but I couldn't resist having a play today and temporarily fitting a few bits together to see how it looked. What I'm building is a pop-top, but a hard-sided and fully-insulated pop-top (we like to be able to camp all year) that borrows inspiration from Alaskan campers (I've always loved them but they are seriously big and heavy), Tonke campers (very expensive but I do like their wood finish and for a long time was going to go for that myself) and the Paul Butler camper (I was almost tempted to buy a set of his plans but figured it couldn't be that difficult and have since read some very disparaging comments about them and so am glad that I didn't). 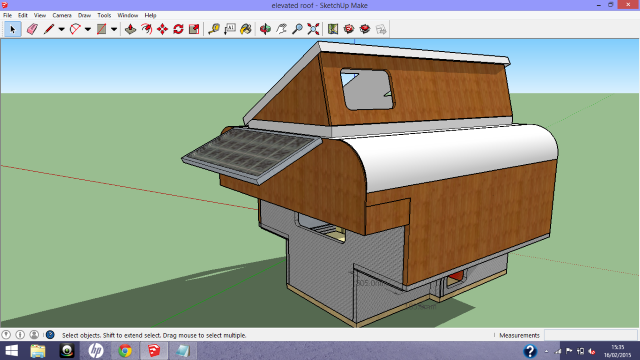 Instead I downloaded SketchUp (just amazingly powerful for a freebie) and started trying to sort out some ideas of my own. - be a pop-top but sufficiently insulated to be usable all year. - be usable if required, either for security of for extra warmth, with the roof down. - be predominantly constructed of wood - its warm, flexible and the only material I'm confident of working in. - fit the pickup without having to remove its tailgate. - carry its weight as low and as far forward as possible. - have a maximum dimension of 2400mm (8ft) in order to minimise joints in the skin. 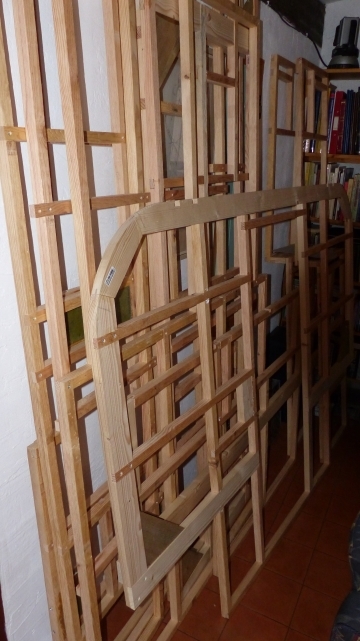 I know larger sheets of material are available but they're costly to transport and, for me, difficult to work with. Anybody got any useful experience with two-part polyurethane deck paints? I gather they can be difficult unless conditions are perfect. Last edited by saDgit on August 4th, 2018, 1:46 pm, edited 1 time in total. We were wondering (actually) where you'd gotten to, fairly obvious now. Took me quite a while to get into it and I'm still a long, long way from being any kind of expert. Some examples of what experts can produce are truly staggering. I found some useful tutorials on YouTube, particularly those by Matthius Wandel. 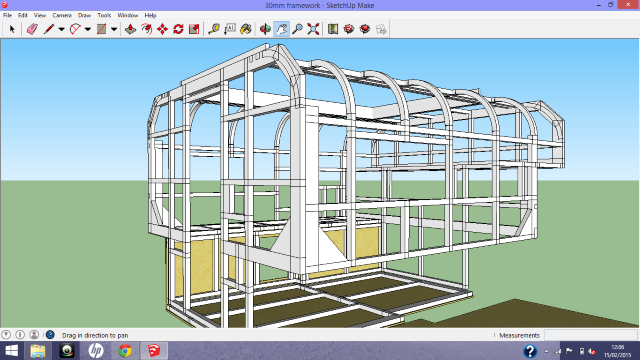 It's taken quite a few hours but, having got the framework 'built' in SketchUp, it's been fantastically useful to be able to go back to it again and again as I've built the real thing in order to check dimensions, etc. Well worth having a play with it just for its own sake. Sorry guys, not a lot to report I'm afraid. We've been away for the last couple of weeks so the build has not moved much further on and I'm back just in time for an appointment for some gum surgery tomorrow (deep joy!) so may not get much done for the next few days either. I have received the jacks that I ordered from Rieco-Titan Products Inc. in Illinois though. 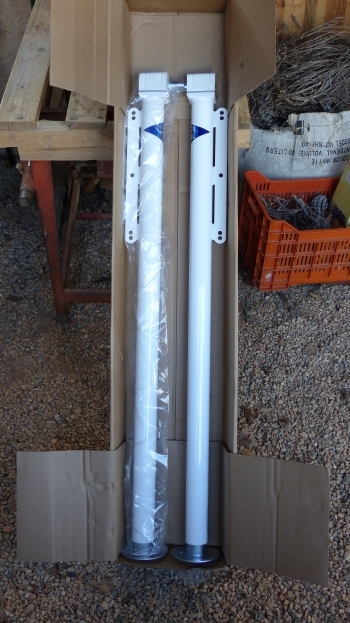 Rieco-Titan offered me a really good deal and exceptional service and they also secured a very reasonable quote from UPS for shipping to me here in France and within four days (including a weekend) of placing the order they had arrived in Paris. Then, inevitably, the bureaucratic machine kicked in and the jacks spent a week in the custody of French customs. After I'd provided them with a description of what they are, pictures of how they work, links to the Rieco-Titan website, and so on, they eventually released them but in exchange for about 50% of the purchase and shipping price combined!! Guess I should have seen that coming, huh? I shan't actually need them for months of course but I wanted to know that I was building appropriate strength in the right places from the outset. Last edited by saDgit on August 4th, 2018, 1:49 pm, edited 1 time in total. As you'll see I'm turning the 'standard' European layout completely back-to-front. My camper was never going to have the permanaent bed in a full luton anyway and so by putting the seating area/bed at the back almost all of the heavy items are concentrated over or as close to the rear axle as possible. There are compromises in this of course. Most obvious and, for us, the most costly is that we don't have a permanent bed. That's a first for us, we've always had one before but I guess we'll get used to it. We also have no way of making an additional berth but that's fine. We have no permanent shower but I have made provision for an external one (We had one on our Leisure Camper and, amazingly we did use it - even in the Arctic Circle! ), and we can only accommodate a Porta-Potti rather than a cassette toilet which requires access through an external wall of course. 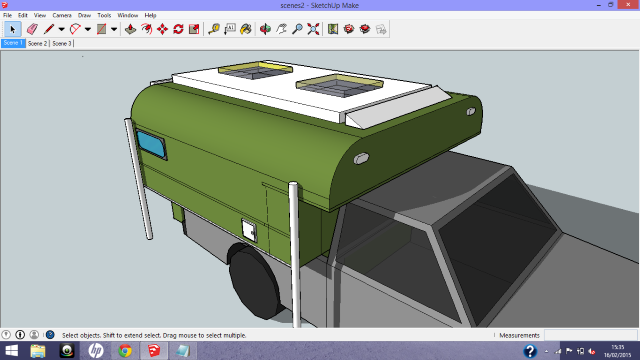 We also have to be able to move the toilet in order to gain access to the front tie-downs through the camper sides. Lack of internal shower and portable toilet are compromises but bear in mind this is designed to be a camper (i.e you clean your teeth in the kitchen sink) not a luxury motorhome (i.e. you clean your teeth in the en-suite). Water tank (blue) sits under the raised front floor as is common. Malaga water heater (turquoise) sits under the kitchen unit as do two of Gaslow's refillable 2.7kg cylinders (yellow). That's not a huge gas capacity but, crucially, it is very compact and with a compressor fridge (Waeco CR65, green) should be sufficient for our needs. The other item near the back is a Whale blown air heater (red) and at just over 6 kilos that's not really a problem. Whether, or not, it all works in practice only time will tell. Last edited by saDgit on August 4th, 2018, 1:52 pm, edited 1 time in total. Looks good doesn't it, where are you getting these ideas from Martin? departing from the fixed bed would be difficult decision for me at least, it seems to intrinsic especially now we've had the luxury a few years. 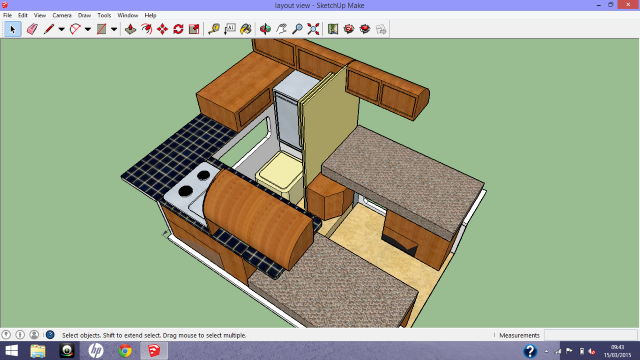 Ideas have come from the depths of my twisted imagination and from trying out dozens of different layouts in Sketchup. 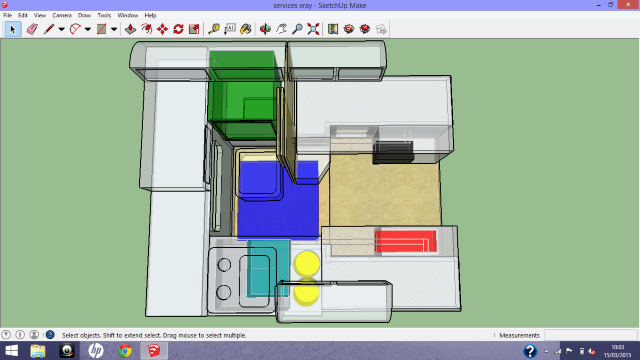 That relatively large kitchen work area earns me some brownie points though!